"A spill in Palmeira Avenue, Hove. February 13, 1909"
Photographer, Hove. Edward Austin can be shown to have been the publisher of some sepia-tinted real photographic cards of Brighton and Hove that are initialled "E. A." but to the bafflement of collectors provide no other useful clues as to their origin. Some of the earliest cards depict camps of the 3rd County of London Imperial Yeomanry at Whitehawk (near Black Rock) in 1906 and 1908. The handwritten captions were evidently added directly to the negatives, and sometimes look rather untidy and obtrusive. In addition to being initialled "E. A." some of the photographs of the camps are also marked "Morgan's Library". Charles Morgan established his fancy stationery business and lending library at 86 St. George's Road by 1905, and was still trading in 1921. There is no reason to believe that he was the same person as E. A., but quite possibly he went into partnership with E. A. to produce the cards of the camps. No other E. A. cards are labelled "Morgan's Library". A card of Preston Church issued soon after it was badly damaged by fire on June 23, 1906 has an untidy caption of the kind seen on many of the cards of military camps. Later E. A. cards have captions written on transparent slips, presumably in order to give the cards a neater and more professional appearance, and to avoid damage to the negatives. Unfortunately, the slips are sometimes rather conspicuous. E. A. seems to have been particularly attracted to "disasters". A card dated June 9, 1907, shows the fire gutted remains of Abbey and Sons malthouse and stores in Brighton. 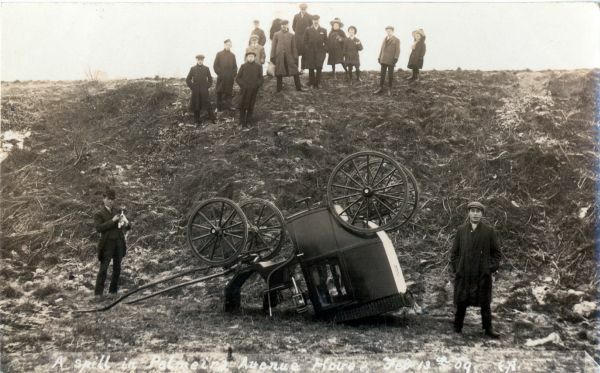 The sepia-tinted card of a carriage accident in Palmeira Avenue in Hove (reproduced above) dates from February 13, 1909. More peaceful in character is the black and white card (included in the Gallery) showing the interior of the Church of St Thomas the Apostle in Hove decorated for Harvest Festival in 1909. A sepia-tinted card of the French Convalescent Home in Brighton has been found that was posted in February 1908. At least three cards published by E. A. show holidaymakers on the beach at the western bathing station at Hove. Deck chairs and bell shaped bathing tents give the cards a quite modern feel. Also interesting are 12 or more sepia-tinted cards of the wards of the Sussex County Hospital. One card has been found postmarked June 1909, so production of the cards must already have begun by this date. On what appear to be later versions of the cards the handwritten captions are replaced by captions printed using a crude, probably hand-held printing device. One of these later cards is dated "1912" next to the caption - clear evidence that E.A. continued to be active as a postcard publisher six years after he started. Edward Austin was born in Hove in 1883, and was the third son of Jesse Austin, a nurseryman. Jesse had been born in Sompting in about 1850 and had married Lucy Grover from the same village in 1873. The couple had five children besides Edward: Ernest Austin (born 1878), Jesse Austin Junior (born 1881), Harry Austin (born 1885), Lucy Austin (born 1887) and Oliver Austin (born 1893). In 1891 the Austin family was living at 3 Westbourne Place in Hove. Jesse Senior died in 1895, aged only 45, leaving his widow to bring up the children on her own. When the 1901 census was held, she and five of the children were still living in Westbourne Place, but at Number 7 - perhaps the house had been renumbered. Both Ernest and Edward were working as photographic assistants, and Harry had become a grocer's assistant. Lucy Austin moved by 1905 to 42 Cowper Street in Hove and then to Manchester Street where she rented out apartments. At the start of his photographic career Edward Austin served a lengthy period of apprenticeship to James Williamson (1855-1933), one of the celebrated pioneers of cinematography, starting in about 1898 at the latter's shop at 55 Western Road, Hove, and transferring in 1902 to the new Wilbury Works studio and film production facilities that Williamson built in Hove. He sometimes acted in Williamson's films, and often operated the projector at public film screenings. He also helped Williamson carry out X-ray photography at Brighton Hospital. In about 1908 Ernest and Edward Austin set up in partnership as stationers at 11 Westbourne Place. The 1911 census records that Edward was living at this address with his mother, who had left Manchester Street, and also with Oliver, who was a greengrocer's assistant. Edward is described as a photographer, not as a stationer. Ernest is not listed in any English or Welsh county in the census index, so perhaps he had gone abroad. Pike's 1918 and 1919 Directories of Brighton, Hove and district record that Edward Austin lived at 3 Chapel Terrace in Kemp Town, off St George's Road, and that E. Austin was a stationer at 11 Westbourne Place. Kelly's 1920 Brighton Directory and 1922 Sussex Directory confirm that it was Edward Austin, who was the stationer at 11 Westbourne Place, and not Ernest. In January 1924 when he was 40, Edward married Ethel Ruth Trigwell, a 26-year-old domestic servant, at the Congregational Church in Hove. The couple went on to have two sons, Douglas Austin born in 1924 and Edward Ralph Austin born in 1926. By 1926 Oliver Austin was trading as a newsagent from the Westbourne Place shop. Angie Preston reports that Edward Austin, who was her grandfather, did a lot of studio portraiture and that his camera still survives, as does the impressive studio chair on which he seated clients. Edward's postcard production was quite limited, which suggests that he derived most of his income from his stationer's business and studio work. He died at 11 Westbourne Place in November 1955, aged 72. Ethel, his widow, later remarried. Acknowledgement: This website is greatly indebted to Angie Preston for supplying much useful information about Edward Austin and his family.